Preheat the oven to 220°C/425°F. Peel and crush the garlic cloves and place in a bowl. Thinly slice the scallions, adding the white parts to the bowl with the garlic, and setting the green parts aside for garnish. Separate chicken legs into thighs and drumsticks, trimming excess fat and skin as needed. Brush both sides of the drumsticks and the skin side of the thighs with olive oil. Season both sides of the chicken with salt and pepper. Place an ovenproof pot over medium-low heat. Let it heat up, then add the chicken thighs skin side down and drumsticks and let cook, undisturbed, for approx. 5 min. Turn up the heat to medium-high and cook for approx. 10 min. more. Flip the chicken with a pair of tongs and let cook for approx. 5 min. further. Turn off the heat and scatter the white ends of the scallion and crushed garlic cloves into the pot. Transfer the pot to the preheated oven and roast the chicken at 220°C/425°F for approx. 15 min. or until chicken is cooked through. Remove chicken from the pot and set aside to rest, uncovered. Scoop out the garlic cloves and transfer to the mortar and pestle, season with salt, and mash into a paste. Stir into the pan sauce. Place the pot over medium heat and add butter, stirring to melt. Deglaze the pot with rice wine vinegar, scraping the bottom of the pan. Let cook for approx. 2 min. 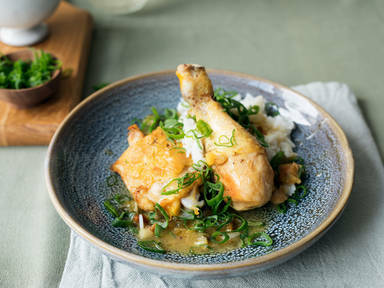 Serve chicken with white rice and drizzle with the pan sauce. Garnish with the chopped green scallions tops and enjoy!